The Bad Billboard Project wants to change the world: "I see billboards that are unreadable, outdoor advertising that makes me less likely to buy something from the advertiser, and only once in a while a billboard that works. But rather than going on a rampage and burning down the offensive tripe, I can now just blog about it and work out my frustrations with no harm being done other than the potential embarrassment to the advertisers." Is that a real billboard? It seems a little... impossible. 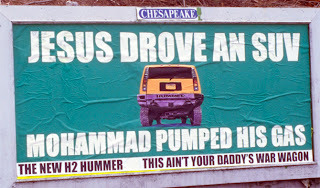 It seems more like a civic outcry against the war, SUV's, and religious schisms than a real Hummer ad. I don't think they'd call their own products "war wagons".